The story of Universal Pictures and Illumination Entertainment's Minions begins at the dawn of time. Starting as single-celled yellow organisms, Minions evolve through the ages, perpetually serving the most despicable of masters. Continuously unsuccessful at keeping these masters - from T. rex to Napoleon - the Minions find themselves without someone to serve and fall into a deep depression. 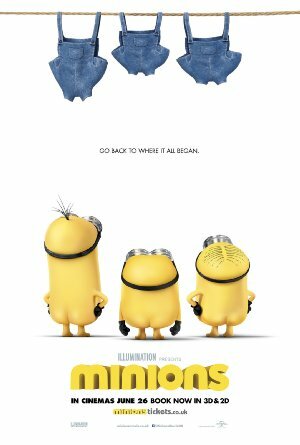 But one Minion named Kevin has a plan, and he - alongside teen-age rebel Stuart and lovable little Bob - ventures out into the world to find a new evil boss for his brethren to follow. The trio embarks upon a thrilling journey that ultimately leads them to their next potential master, Scarlet Overkill (Academy Award winner Sandra Bullock), the world's first supervillainess ever. They travel from frigid Antarctica to 1960s New York City, ending in modern London, where they must face their biggest challenge to date: saving all of Minionkind...from annihilation. Featuring a sound-track of hit music from the '60s that still permeates our culture today, Minions is produced by Illumination's Chris Meledandri and Janet Healy, and is directed by Pierre Coffin and Kyle Balda. Brian Lynch has written the screenplay for the 3D-C.G. comedy adventure, and Chris Renaud serves as executive producer of the film.